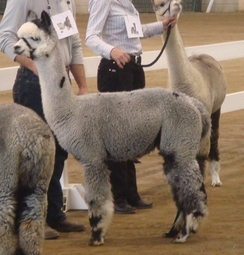 Born from Laurel Ridge's experience pioneering the development of the grey fleece in the US, Silver Accent is now standing at stud at Red Star Alpacas. 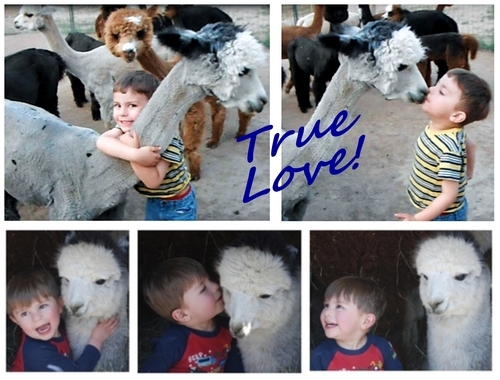 His cria, beginning in 2009, have expressed strong grey genetics. 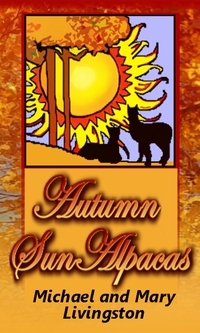 Red Star Alpacas writes: "He has a beautiful fleece correct structure and a wonderful disposition. 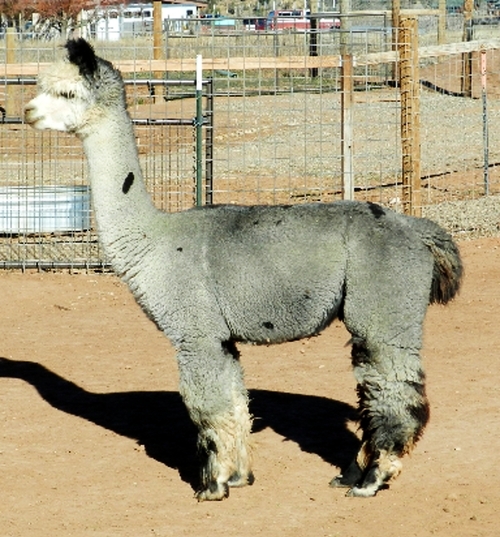 Rarely do you find a grey fleece that is this soft, crimpy and consistent color. Accent has a wonderful head and a correct bite." Millie is a hands off easy (no issues, ever) care, excellent dam, and producer of color! 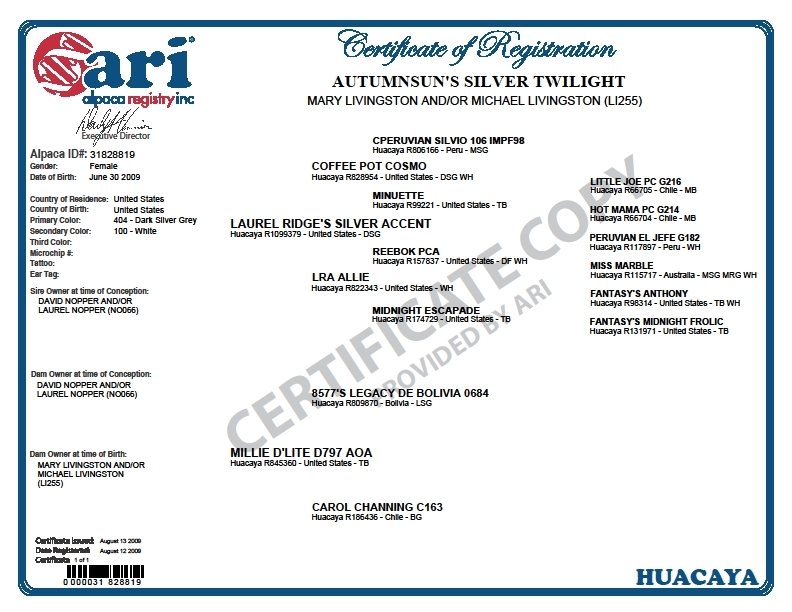 This is not surprising, since her lineage has a solid base of Bolivian and Chilean color. She is really protective of her crias, but that is easy to work around with judicious bracketing of animals in different pens, so we don't have any headaches with that. She has built a trust level with us that makes things move along fine. 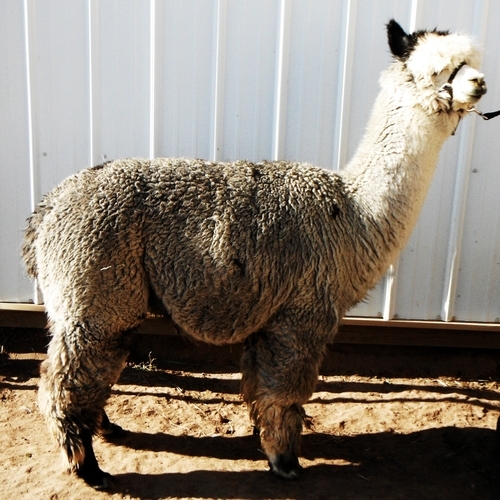 Silver is a grey female with grey/black genetics that is proven to produce grey crias. 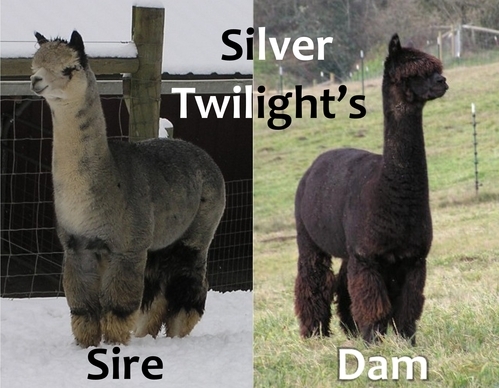 Proven Dam of Grey: MSG female by Emerald Farm’s Rincon Cloud that sold as a weanling, and DSG male by Silver Peruvian Master Piece with very fine, silky fiber. •	Genetic Diversity from the Overused Grey and Black Genetics. •	Calm and Friendly -- an ‘Easy Keeper’. •	Consistent Grey Coloration w/Minimal Spotting. •	Uniform character and micron, good density, wonderful handle and loft when spun. •	Well covered, dark eyes, nice wedge face and ears. •	Solid bones, good frame and straight conformation, and moves easily and gracefully. •	Little change in micron and uniformity as she ages (especially for a grey) between micron counts. She has soft handle with consistent micron and crimp style across her blanket. Her 2016 fleece still spins into a lovely even-colored, lofty, soft next-to-skin yarn that makes beautiful accessories. Silver's 2017 cria is a beautiful classic smokey colored dark silver grey male! This winter boy is sired by our 13x black champion AutumnSun’s Black Maelstrom -- 6th generation of black on his sire’s side, son of our 7x Champion Special K and by 5x Black Champion Dark Secret -- so he carries black genetics with his grey phenotype. For the time being, her 2017 cria will be sold at her side. In addition, her price includes her 2018 breeding to any of our unrestricted herdsires. 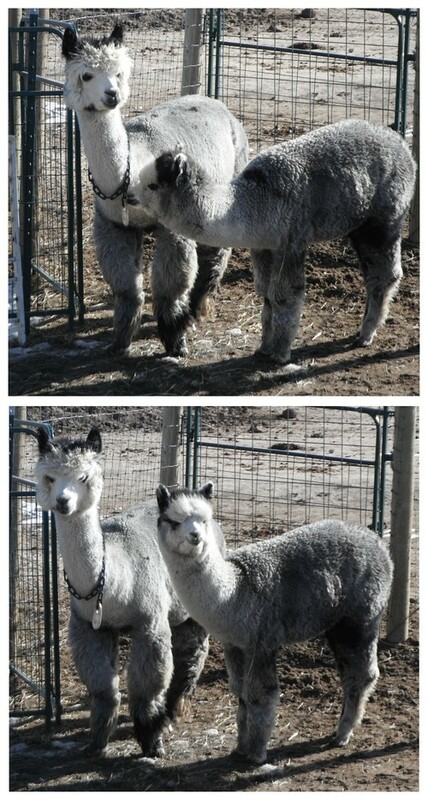 Silver has produced grey crias three times, so we are thinking taking her back to a grey program would be ideal. We suggest either to our 8x Champion Dauntless or our 3x Champion Longbow.